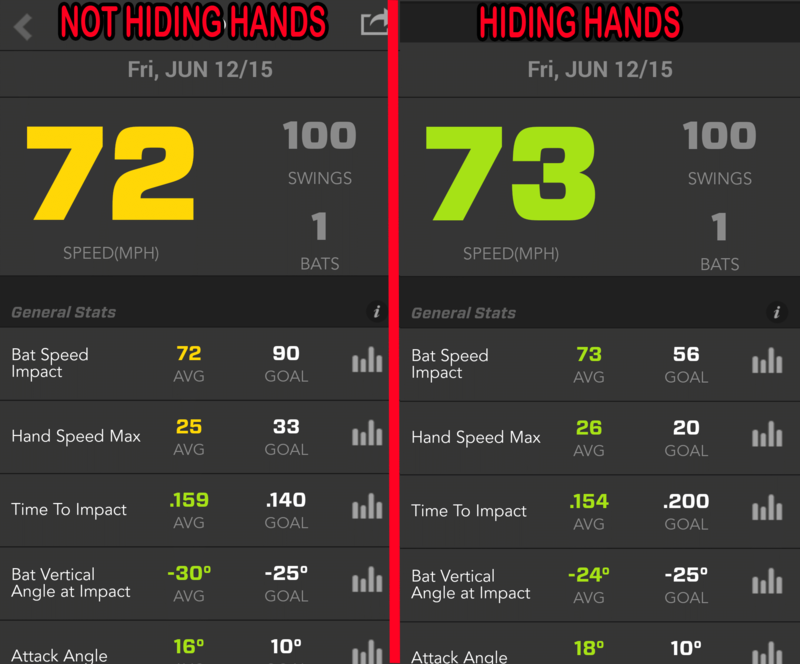 Question: Does Hiding the Hands Increase Bat Speed versus NOT Hiding Them? Using the Zepp (Labs) Baseball app , I wanted to use the Scientific Method to analyze if hiding the hands from the pitcher prior to stride landing boosts bat speed, over not hiding them. Some may call this the “Scap Row”. And we’ll see what proper baseball hitting mechanics look like with MLB Player of the Week (July 6th) JD Martinez of the Detroit Tigers. My intern for the summer, red-shirt college freshman Tyler Doerner did the experiment. Most hitting instructors may call this the Scapula Row, or Scap Row for short. “Hiding the hands” is essentially the same thing, but is a much more sticky coaching cue. “Hiding the Hands” has to do with loading the springy fascial material in the body. Without this springy fascia your bones and muscles would drop to the ground. It’s what gives muscles their shape, and what the bones and muscles ‘float’ in, according to Thomas Myers in his book Anatomy Trains . “Hiding the Hands” also allows a hitter to be in proper baseball hitting mechanics to achieve high angular velocity early in the turn. This has to do with the Conservation of Angular Momentum. Achieving high angular velocity, early in the turn, is critical to Time To Impact and covering more plane of the pitch with the barrel. Based on the above research, I think proper baseball hitting mechanics, a la “Hiding the Hands”, from the pitcher (pre-turn) will have a big impact on bat speed versus not hiding them. I think results will be similar to what the “Showing the Numbers” Experiment revealed, where we saw an average bat speed increase of 6-mph over 200 swings. Tyler uses a SoloHitter in the Experiment. The SwingAway Bryce Harper is swinging on is similar. 33 inch, 30 ounce wood bat. On average, .005 change in Time To Impact. Top-4 “Hiding the Hands” bat speeds (in mph): 85, 84, 84, and 82. Top-4 “Not Hiding the Hands” bat speeds (in mph): 82, 81, and the rest were less than 79. So, top out bat speed increased by 3-mph, and there were consistent higher bat speeds with “Hiding the Hands”. The results of the proper baseball hitting mechanics “Hiding the Hands” Zepp Experiment may have been skewed because Tyler didn’t take a break between tests. About JD Martinez…this FanGraphs.com link titled, “JD Martinez on His Many Adjustments” is a great example of players today opening their eyes to how the body really moves, and not what some talking head thinks. Basically, JD Martinez subscribed to swinging “down on the ball” until he got injured in 2014, I believe. Then he started analyzing teammates’ and opponents’ swings that were crushing the ball, and found out they weren’t swinging down at all. A week or two after the 2015 All Star break, according to FanGraphs.com, JD Martinez had 27 homers. His season high before that? 23, in 2014. To me, JD Martinez is a big slugger at 6’3″, 220-pounds. But when big sluggers do small slugger things (like being more effective with mechanics), even bigger things can happen. JD Martinez does a great job of “Showing his Numbers” and “Hiding the Hands”. This compresses the springy fascia material in the body. 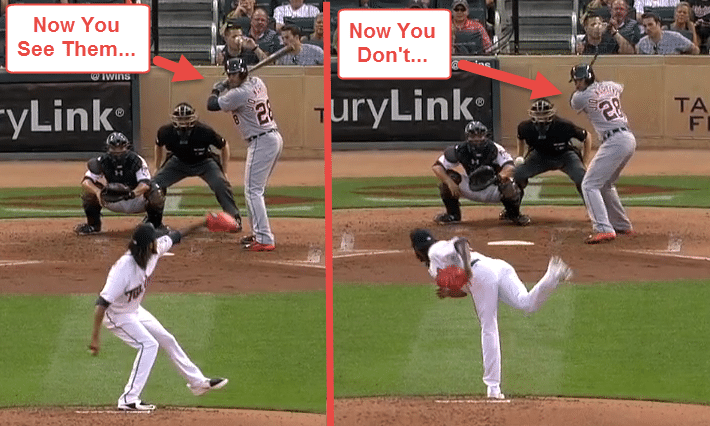 In this proper baseball hitting mechanics “Hiding the Hands” Zepp Swing Experiment, “Hiding the Hands” doesn’t seem to give a hitter a significant jump in Bat and Hand Speed, or Time to Impact. But definitely an increase nonetheless. But what using proper baseball hitting mechanics, like “Hiding the Hands”, does appear to do, is boost top-out bat speeds. 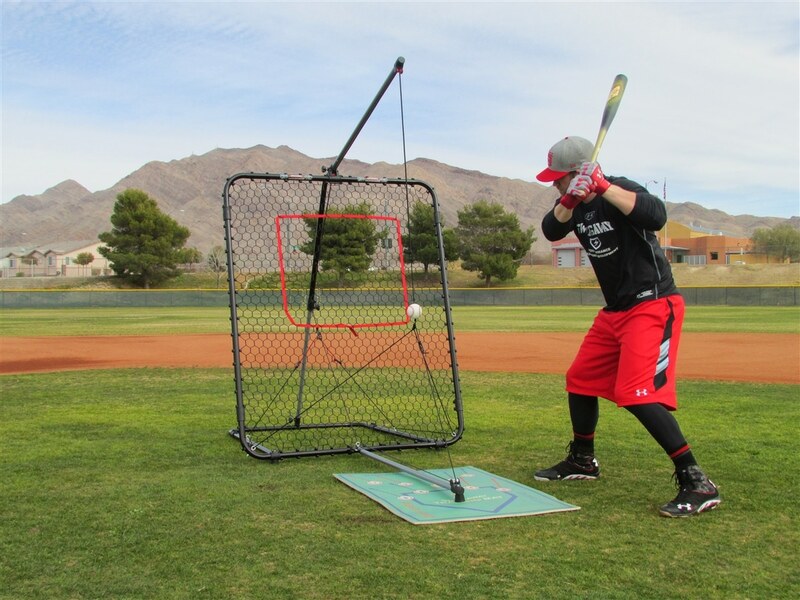 AND, make those top-out bat speeds repeatable. Baseball Swing Mechanics Experiment: Squash The Bug Ineffective? Hi Joey, I need some clarification about hiding the hands. The 3 ways I know to hide the hands are 1. show # to pitcher by shortening left shoulder to right hip 2. By pinching the right scap and not showing # to pitcher (I do not teach much) 3. And this is my real question, why can’t you do both? Good question Andy…and I do both 1) showing numbers, and 2) hiding hands. The motion should be connected as one. But I break the two movement down into their specific parts because at first the body looks at them as two separate movements. Some of my hitters do a good job of showing numbers, but not so much with hiding the hands. The objective is to integrate both movements. Not to be hypercritical, maybe Tyler is not performing the counter-rotationary movement (down and in with the front shoulder, “hitting backwards,” showing the pitcher your #s, etc.) enough, creating the the necessary separation to make a more significant difference in bat speed. Just a thought. Joe, you’re right!! We’re actually working on that with him. He tends to release his front shoulder too soon. But for the experiment, as long as he’s doing it the same for both tests that’s okay. If that’s the case (which I think it is), then whether he shows his numbers and has a down shoulder angle doesn’t matter. We want to compare apples to apples. Also, don’t take my word for it, repeat the experiment yourself and see if you get different results. Tinker and test this stuff. I didn’t understand when you said that he did it the same way. I thought that he was testing to see if showing the #s generated more bat speed than not. lol, sometimes it’s hard to pick up on satire over the inter-webs 😛 No, Tyler was testing hiding the hands v. not hiding the hands. I said in the post that oftentimes I teach hiding the hands and showing the numbers at the same time. They tend to go hand in hand, pardon the pun. The Biggest Lies In Early Sport Specialization Baseball Swing Mechanics Experiment: Squash The Bug Ineffective?